We’ve previously looked at the types of car safety seat available for your child, and how best to fit them. Now we’re going to examine the safest positioning in your car, especially if you have a young family and need two or more seats. In any modern vehicle such as a saloon car or minivan, there are basically four positions available to place a child safety seat. They are the front passenger seat, and three positions in the rear seat, behind the driver, in the middle, and behind the passenger. Let’s look in turn at each of these positions to see which is the safest. Safety experts all agree the best place for a child in a safety seat is in the rear seats, not the front. Some parents argue attention needs to be paid to their child when they are in the car; if that is the case, they cannot be paying enough attention to their driving, and this can cause an accident. If you have a small car with only front seats, then the passenger seat might be the only option. If your vehicle is fitted with a passenger airbag, that must be deactivated if you are using a baby’s rear-facing safety seat. Your baby can be seriously injured in an accident by the airbag if it is not. In some places in the world, the law requires the bag to be deactivated. For forward-facing safety seats, the front passenger seat should be as far back as it can go to avoid injury in a crash. Of all the seats in the rear, this is probably the most awkward for a parent traveling with a small child in a safety seat. For one thing, getting in out of the car will be on the traffic side of the vehicle, and therefore more hazardous. Also, the child will be in the blind spot, as the driver you would not be able to check up on them using the rear-view mirror. This is a much better option than behind the driver, as loading and off-loading your child will be done from the safer sidewalk side of the vehicle. Also, should you have to monitor your child, they can be seen in the rear-view mirror, or by a quick turn of the head when at a stop light. Provided this part of the rear seat has a three-point seat belt with a shoulder and lap strap it is the safest place to put your child in a safety seat. For one thing, it is furthest away from the sides of the vehicle in case of a side-impact accident. A study published in the journal Pediatrics explained that children up to the age of three are more than 40% safer sitting in the middle rather than the side of the rear seat. It may be just intuition, but two in five parents put their child in a seat positioned in the middle. If you have an Isofix style safety seat, and your vehicle has the correct anchoring points, they can only be fitted to the center section of the rear seat. Whatever child safety seat you have, check with the manufacturer’s handbook to see what type of seat belts it needs to be safely anchored. Some seats specify they can be anchored with just a lap seatbelt, and do not the diagonal strap. OK, so we realize that the safest spot for the first child safety seat is in the middle of the rear seat, but what happens next, and you’ve got a second child to contend with. Parents often try to have their children just a few years apart so young families are often a toddler and baby. It can be an unnerving to decide how to keep the two youngsters as safe as possible when traveling by car. Let’s say you have a car safety seat in the middle of the rear seat in your vehicle, and a new child comes along, what do you do? Where do you put the baby, and where should the infant sit? Should you put the baby in the center position, as a newborn is the most vulnerable in a vehicle accident, or should you put the older child in the center and put the newborn in a rear-facing seat on the passenger side? Remember babies in rear-facing safety seats are five times safer than in a forward-facing seat. Most experts agree that a newborn in a rear-facing seat, anchored in the center of the rear seat will be in the safest position possible. Accident statistics show that most crashes are a frontal impact, and the rear-facing seat makes it many times more reliable for the child’s head, neck, and back. As we have said before being in the middle also protects against side-impact crashes. The accident statistics really can’t help you decide on where to place a second seat, behind the driver or passenger. There is virtually no difference in the risk of sitting on the left or right-hand side of the vehicle. So other factors such as convenience can come in to play. As we mentioned before, putting the second seat on the passenger side, has curb safety appeal, and the ability for the driver to occasionally check how things are going on in the back by using the rear-view mirror or a quick head turn. When going for a second safety seat check that it will fit alongside the one already installed. You might find the same brands will work together, rather than mixing and matching. 1. Try not to use the safety seat out of the car. Child car safety seats are designed for children while traveling in a vehicle, they are not a crib or to be used to carry your child from one place to another. Using a car seat for extended periods can pose a health risk. Your child’s ability to breathe can be affected; long periods in the seat can contribute to developing a flat spot on the back of his or her head. A car safety seat is designed to protect your child in a vehicle accident, not one outside. 2. Make sure your child is correctly buckled into the seat. It’s no use going to the expense of buying a top quality safety seat for your child if they are not strapped in correctly. Read the manual on how to get the straps snug and in the correct position to hold your child securely and safely. 3. Recline your child correctly. 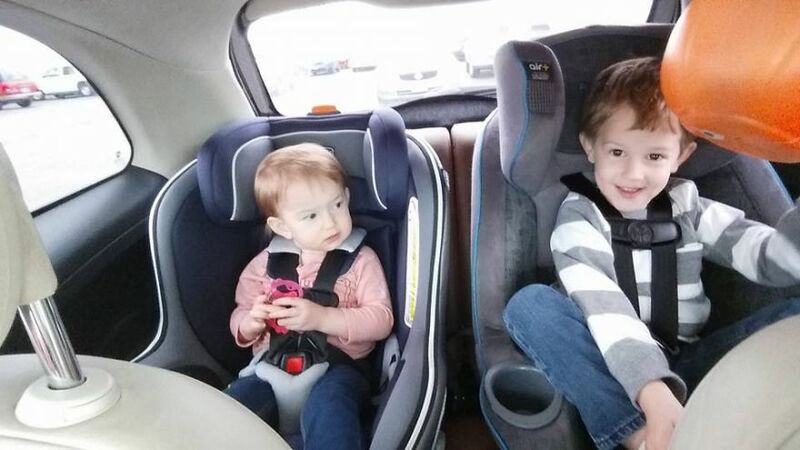 Rear-facing safety seats need the car seat reclined slightly, so the child’s head does not drop forward. It is best if babies ride semi-reclined, so their airways are kept open. As your child grows, these angles will need to be changed. 4. Remove any heavy outerwear. It might seem like a faff, but if you want your child to be properly restrained in their car seat, then it is best to remove heavy outer garments and any blankets. Buckle your child in, and cover them with a blanket or warm jacket.